We’re excited to be launching new walking parties of students who are carrying on their learning in Out of Eden Learn by engaging in Core Learning Journey 2: The Past and the Global. In this blog I’d like to share with you some of the thinking behind our latest curriculum design. Broadly speaking, Core Learning Journey 1 introduces students to the principles of “slow journalism” – that is, learning to observe their everyday surroundings carefully, as well as to listen attentively to others. We also give students the opportunity to share stories and perspectives with others. Core Learning Journey 2 journey builds on those principles. It also introduces more explicit opportunities for students to reflect on how their own lives connect to bigger human stories. For example, students draw visual representations of how their own lives relate to bigger stories of human history, interview someone over the age of 50 about their relationship to the past, and observe an everyday object carefully to try to discern how it might connect to bigger systems operating in the world. 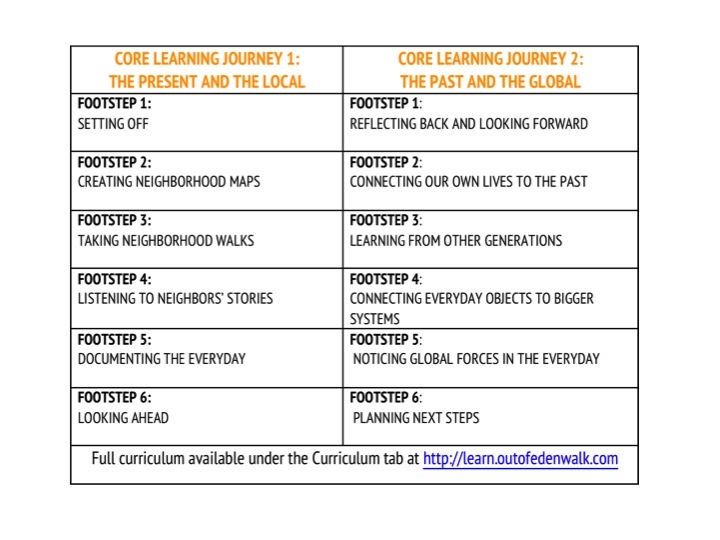 It is worth noting that Core Learning Journey 2 maintains the same format as Core Learning Journey 1, with each footstep broken down into three parts: Engage with Paul’s journey; Do an activity; and Interact with your walking partners. I would now like to dive into some specific changes we have made to the learning activities. Footstep 3: Learning from other generations. Ask the person to talk to you about an object that is important to them. We would like the object to be at least 30 years old. Maybe it is something that meant a lot to the person when he or she was young; maybe it is something that has been passed down through his or her family. Look at the object slowly together, using the See, Wonder, Connect routine. What do you both notice about the object? What connections does the person you are interviewing make to this object? Can they tell you a story connected to the object? We look forward to seeing if this slow looking activity yields interesting stories and reports of powerful, cross-generational learning experiences, especially as tangible objects can be compelling entry points for thinking and talking about the past. This activity now combines elements from two of our previous footsteps: students examine an everyday object carefully, generate a list of wonders about it, and then move on to consider how the object fits into various systems and how one of those systems might be visually represented. Here there has been productive cross-fertilization with Project Zero’s Agency by Design project, led by my colleague Shari Tishman, which focuses on educational practices related to the maker movement. One of the key goals of Agency by Design is to better understand how to help learners develop a sensitivity to the designed dimension of objects and systems in their worlds, so that they develop a sense of agency with regard to them. A sense of agency depends on a sense of connection: Inviting young people to think about systems – such as systems of communication or transportation or food production – helps them see the interconnectedness between themselves and larger forces, and offers them ways of making new connections between the everyday and bigger human stories and contexts. Last year we provided a series of photos and invited students to engage in close looking to discern potential indications of global forces. While this activity was popular among many educators and students, we were concerned that students were overgeneralizing from the photos; we also found that the activity was not generating a particularly wide variety of student responses. Furthermore, one educator raised the concern that as a collection the photos presented an overly negative view of global trends unfolding in the world today. This time round we are inviting students to select their own photo from one of the “Everyday” Instagram accounts, the original being Everyday Africa set up by photographer Austin Merrill and Peter DiCampo to counteract prevailing stereotypes of Africa in the world media. We like the idea of giving students more autonomy to select their own photos from different continents of the world; we are also keen to introduce students to resources beyond those produced for the Out of Eden Walk but which are highly compatible with Paul’s concept of slow journalism. We look forward to seeing creative, insightful work from our students that we can share with you in due course.